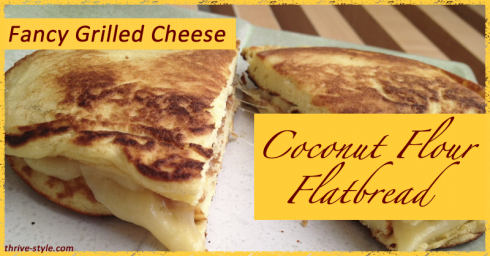 Fancy Grilled Cheese on Coconut Flour Flatbread – Gluten Free! When I was in college, I babysat for the two cutest kids on the planet, Daniel and Elizabeth. Daniel was five, and Elizabeth was six. One afternoon, Elizabeth and I were girl-talking at the kitchen table while Daniel ran around the kitchen and living room in circles. She told me a story about how one day, her mom was making them grilled cheese sandwiches for lunch, and she was very worried because she had always thought they were called “girl cheese sandwiches.” Since Daniel was a boy, she worried that he really shouldn’t eat it! Luckily, she expressed her fears, and her mom explained. Phew! I’ve always loved grilled cheese—and in the past, when I ate grains, I would sometimes make fancy grilled cheese sandwiches for dinner with a variety of cheeses and ingredients, then cut them in small triangles so everyone could try all the different types. People always laughed at me for doing that, until they started sampling the sandwiches! For the past few months, I’ve been trying to come up with sandwich alternatives (sans bread), and I won’t lie–lettuce wraps only fill the craving once in a while! This morning, I was feeling inspired and decided to experiment—and intended to just keep it simple to see what would happen. Worst case scenario, I’d throw it out…and I won’t say that’s never happened before (i.e. it may have happened on Monday). Stir until there are no lumps. Let it sit for a minute (the batter will get a little fluffier). Melt a tablespoon or two of butter (Ideally, pastured, organic, local!) in the pan, and pour two small sandwich sized “pancakes” into your pan (on just under medium heat). It will only spread just a little bit. When the tops start to bubble just a little and the bottom is brown, flip them both over. Put the cheese and other sandwich contents on one slice, and then put the second flatbread on top with the un-done side up. I recommend buttering the top piece while you wait to flip it. 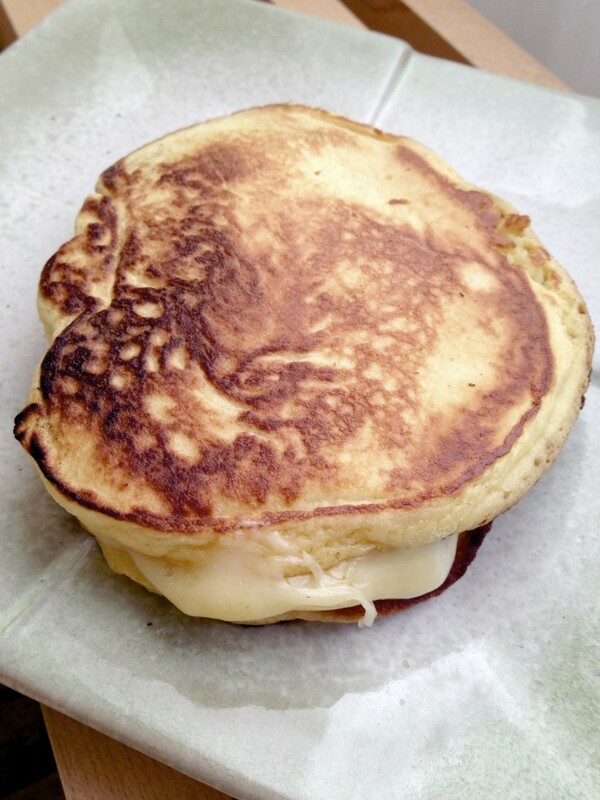 Flip when the bottom is brown, and continue cooking till the cheese is melted and the flatbread is done! This recipe makes 2 sandwich flatbreads. You can double (or more) the recipe. The extras will keep in the fridge for a day or so (you can toast them or heat them back up in the pan… or eat them cold!). 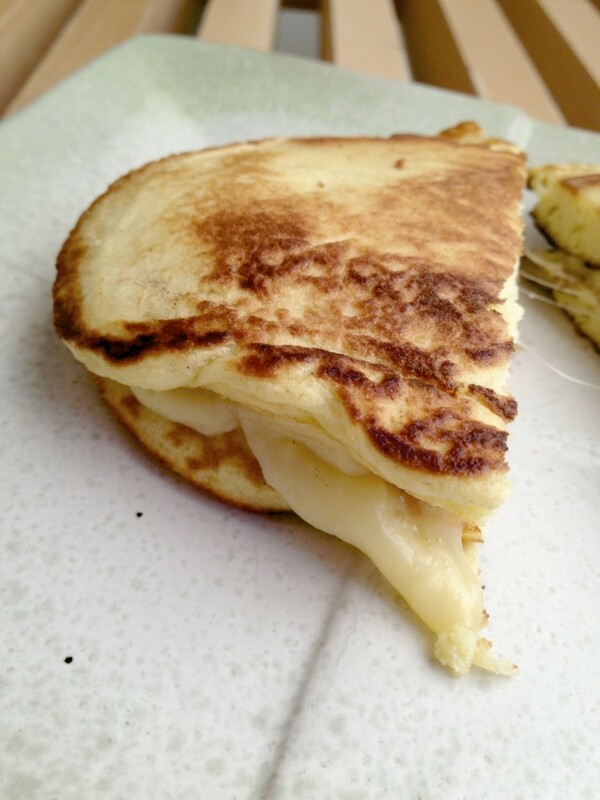 This flatbread is not crunchy like regular bread when made into grilled cheese. It has a great flavor and wonderful bread-y texture. It gets more and more crispy as you add more butter (so I recommend being liberal with it!). 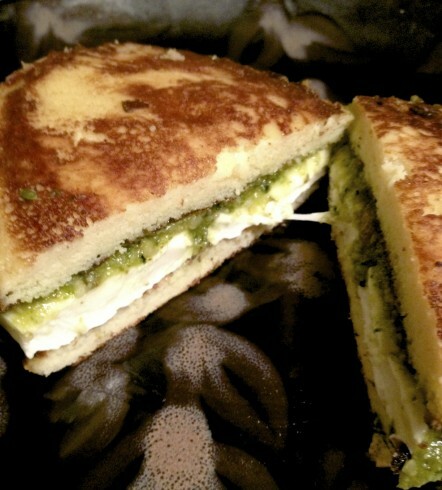 This morning, I made plain grilled cheese, and then for dinner (because I wanted to test the recipe again before I posted it) I made grilled mozzarella and pesto!! Both were great, and I already have a few more combinations brewing in my head (roasted red peppers….swiss cheese…pizza….). 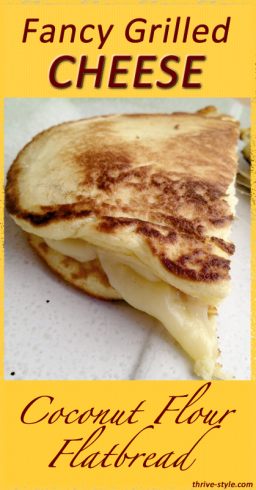 Grilled Cheese on Flatbread—the pieces don’t exactly match up, but it doesn’t matter! I used Kerrygold Dubliner Cheese this morning….I recommend any strong flavored cheese—the bread itself is not salty, so just make sure your contents are flavorful and using salted butter helps too! 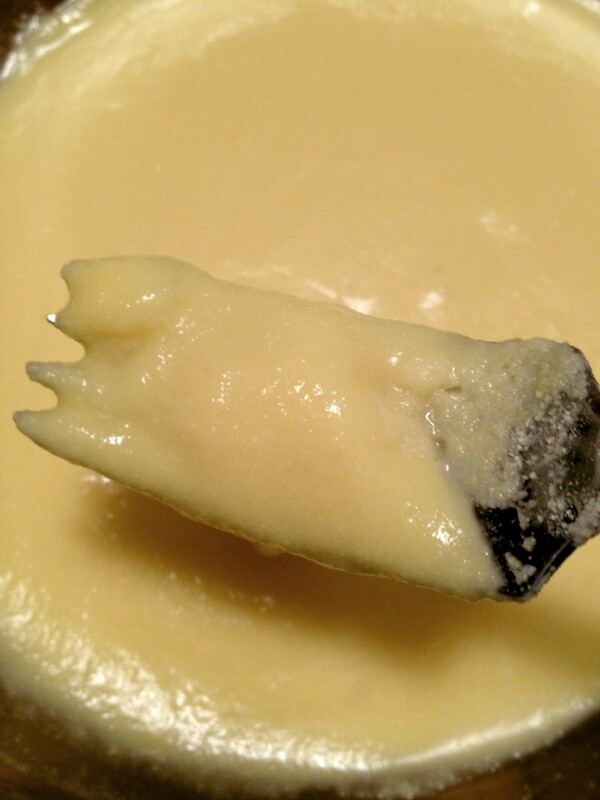 Here’s what the batter looks like when mixed…smooth and pourable, but not too runny. I also use this bread as hamburger buns, bruschetta toasts, for breakfast sandwiches, and for regular sandwiches! 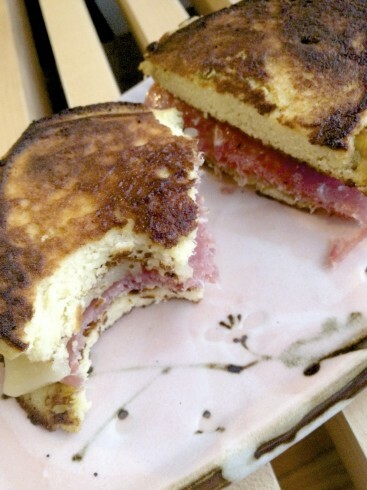 I hope you try this sandwich—and if you do, let me know! Not only does this make great flatbread, but the batter is great for deep frying halibut! I’ve used it twice now, and it is very tasty! Thank you for including some nutritional info, esp calories and carbs. But Could you please clarify? One serving–does that mean “ONE SLICE” of the bread/pancake? OR does one serving mean the WHOLE sandwich serving of the bread/pancake, ie the TWO “slices” to make 1 sandwich serving? Thanks if you could let me know. I’ve made these a couple of different ways but tonight I really wanted something sweet. I made it with just the egg, coconut flour, and cream. Then I poured the whole thing is an 8″ skillet and cooked both sides until it was crispy on the edges and nicely browned in the middle. I put it on a plate, drizzling the remaining butter from the pan over the top. The “cake” soaked that up almost immediately. I added some more butter. Then I sprinkled the top with a packet of Splenda and a dusting of cinnamon. It was officially fabulous! Next time I’m going to try putting the Splenda and cinnamon in the batter. Maybe a few strawberries on top? Who knows. this is coconut flour pan cake. not bread. Do you know how this turns out at altitude?